Multi-media entertainment company, Atlantyca Entertainment has secured a raft of new broadcast deals for their globally popular “Geronimo Stilton” and “Bat Pat” animated series. This latest raft of deals includes the launch of both animated series on Netflix (US). HOP! 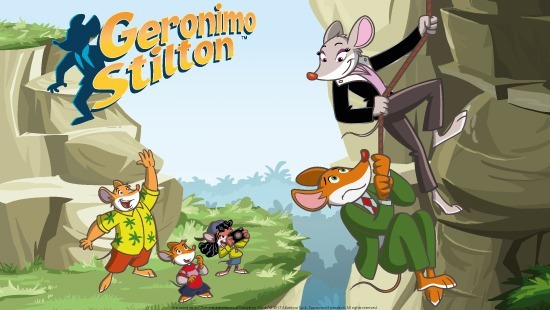 TV (Israel), HAKKA TV (Taiwan) and LRT (Lithuania) have picked-up The New Adventures of Geronimo Stilton, the third season of the series; Derana TV (Sri Lanka) has secured the rights to all three seasons of Geronimo Stilton and in addition Atlantyca’s spooky-animated adventure comedy, Bat Pat, (52 x 11 min); Public TV Company of Armenia has taken the first season of Geronimo Stilton; MEDIACORP OKTO CHANNEL (Singapore) both The New Adventures of Geronimo Stilton and Bat Pat. All 78 episodes of Geronimo Stilton are now available on Netflix with different seasons set to stream on several Netflix platforms internationally. The second season of Geronimo Stilton (26 x 23) is available for streaming in the US now. The first season of the series is available now on Netflix Italy, Norway, Poland, Portugal, Romania, Spain, Sweden, Belgium, Netherlands and Korea, Netflix is streaming the second season episodes in Italy, Spain, Switzerland and Germany. The third season has been launched on February 7th on Netflix Australia, Hong Kong, New Zealand, Singapore, Italy, UK, Canada and Latin America. In addition, Atlantyca Entertainment has signed with Netflix for the streaming rights to Bat Pat, which is already available in Italy, US.,UK, Canada, Australia, New Zealand, India, Singapore and Hong Kong. Bat Pat”, is an Atlantyca Entertainment animated series, in co-production with Imira Entertainment and Mondo TV Animation with the participation of RAI Fiction and TVE. The series has been sold to date to more than 100 countries including Italy, Spain, Belgium, Sweden, Lithuania, Latin America, Japan, Hungary, Middle East and most recently became available in Malaysia, Indonesia, the Philippines, Thailand, Brunei, Sri Lanka, Pakistan, Myanmar, Vietnam, the Maldives, Kuwait, Bahrain, Saudi Arabia, Jordan, Iraq, Lebanon, Egypt, Sudan, Cambodia, Nigeria, Kenya, Ghana and Nepal. Scholastic is the US publisher for the Geronimo Stilton book series.